Hello, hello! Apparently I’m blogging roughly once a month right now?! Hoping to get in a better swing of things, but no promises. I do want to chronicle more of our renovation process, because I know it’s something I’ll want to look back on when it’s all said and done. As we get closer to drywall (please, God?!) I’ve started thinking a lot about the design details, things like paint, flooring, trim, and the like, since those things will be happening shortly after drywall goes up! 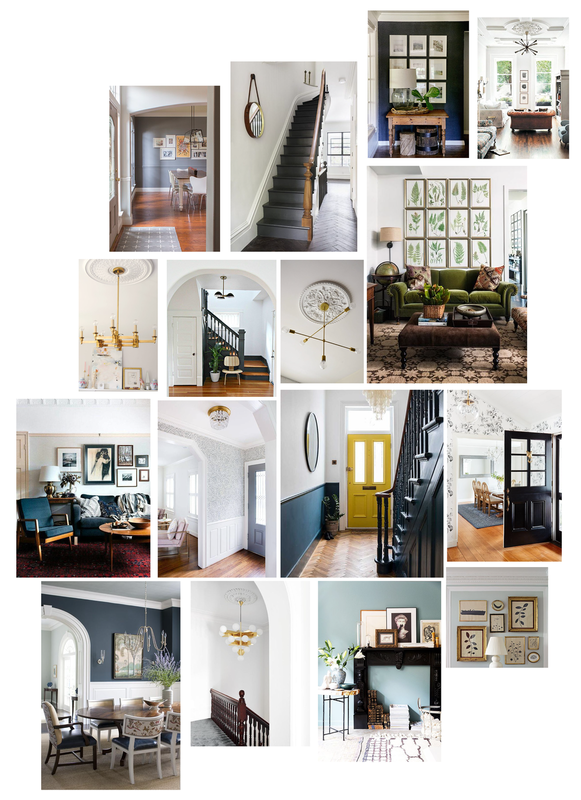 My style has definitely evolved over the last several years, and it’s been so fun to pour over tons of visual inspiration and photos of different aesthetics to figure out what direction I want to go in for this house. So, “modern victorian” is the style I’ve settled on, although it will be much more toned-down than typical victorian style. Maybe “minimalist modern victorian” is a more appropriate label? Or “modern victorian farmhouse”? I don’t know. Labels are kind of lame anyway, because I hate pigeonholing myself into one particular style. 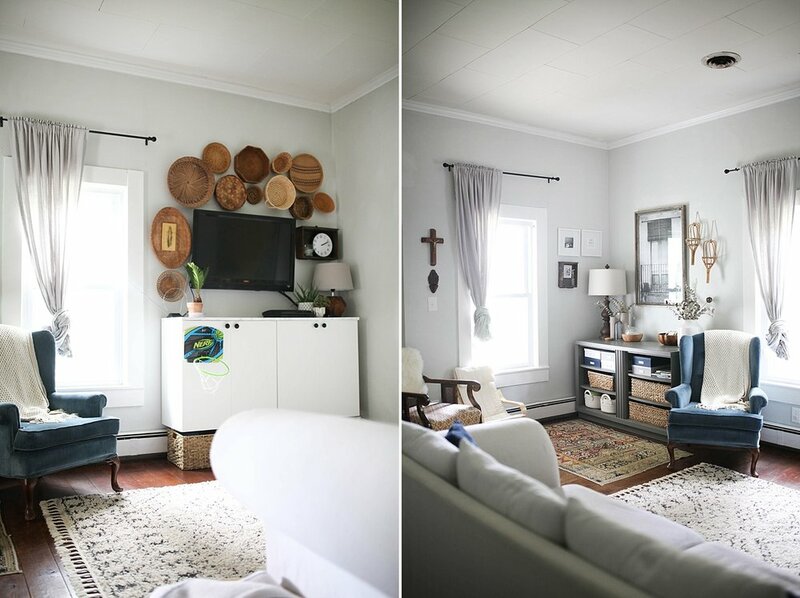 While the bulk of the house will be light + bright as far as paint, I’m excited to bring in some darker, moody colors as accents both on the walls and through art and furniture. I’m also drawing heavily on victorian elements such as floral wallpaper, ornate ceiling roses (I love these paired with more modern fixtures! ), chair/picture rail and paneling on walls, botanical prints and elements, and I’m swooning for those dark painted stairs. It’s different than anything I’ve done before but I am absolutely loving the direction the design is heading and can’t wait to see it all come to life! Any design trends you’re loving? Any other old home enthusiasts out there!? I’m so excited to honor this home’s history and roots while also making it practical and liveable for our family. P.S. Emily Henderson recently said “modern victorian” is the up-and-coming trend so basically I’m feeling very hip right now, ha! As I write this, our family is living with my parents, fifteen minutes away from the house we own which is currently being demo'd. Our giant renovation is officially underway, so I decided it was high time to finally share photos of our home, the way it looked before we started swinging hammers! It will never again look like this (and I'm SO grateful for all the additions that are happening!) so I'm really glad I took the time to snap these photos so we'll always remember the sweet little place it was before the massive changes. We bought our home in the fall of 2014, and we bought it *hoping* to someday do a large-scale renovation. The house is just two bedrooms + one bathroom, but it has a huge, walk-up attic that we hoped to someday turn into liveable space. My dad owns a construction company and has for my entire life, and he has a lot of experience building homes and doing major home projects like this, so we felt good buying the house, knowing he could lend his expertise when the time came. More on that in a future post! Here is the floor plan of the house when we bought it. This is the layout we've been living with for 3.5 years. We've done a lot of work to this little place. 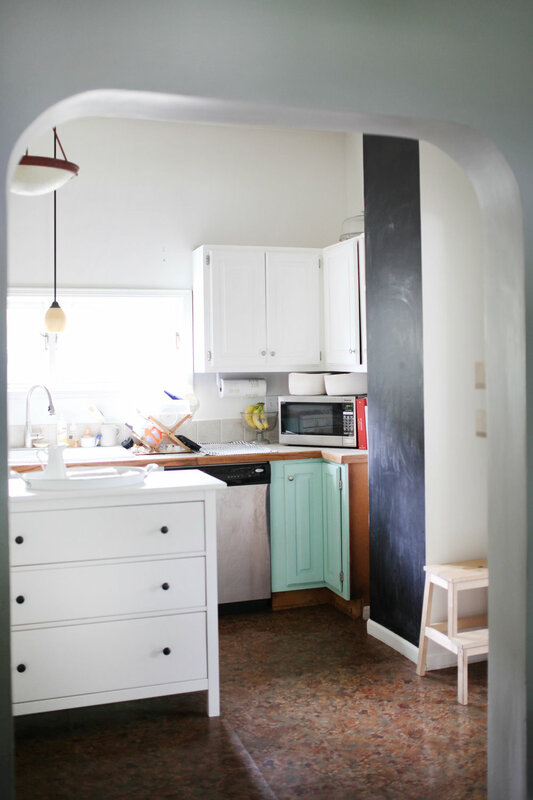 Painted every room, added fun things like the chalkboard wall in the living room and floating cabinets in the living and dining rooms. 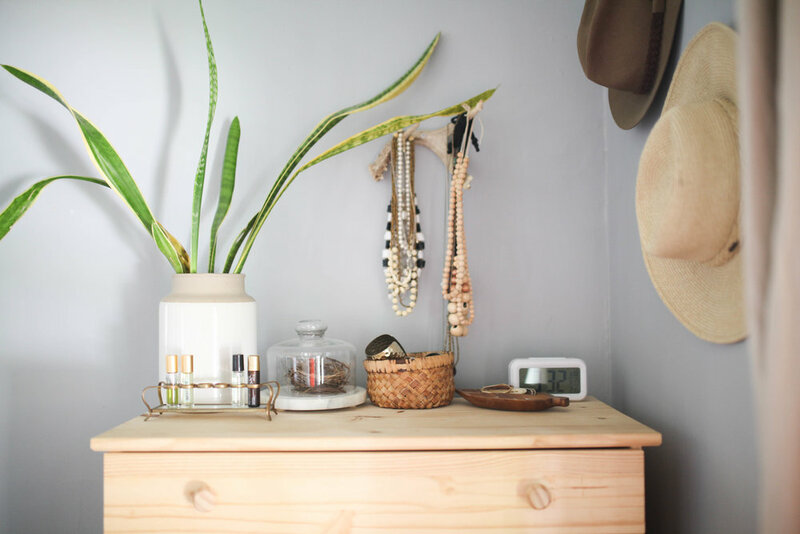 I absolutely love decorating and intentionally styling a space to make it feel like home. 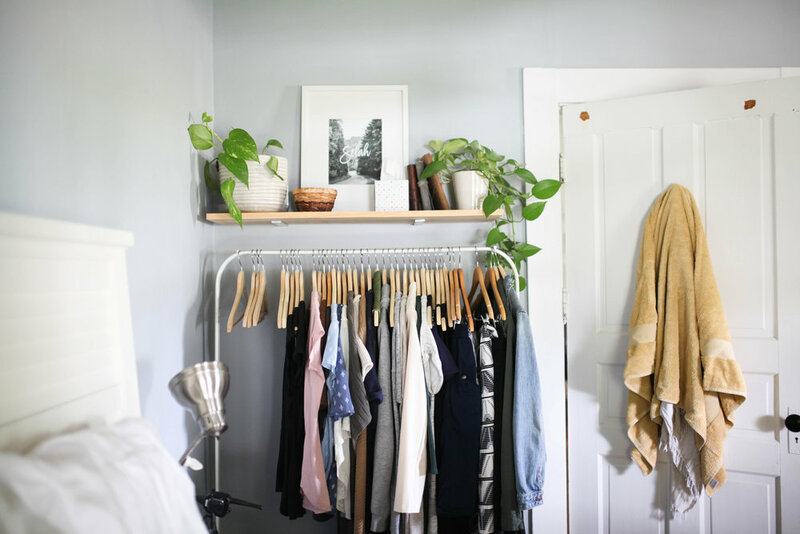 Over the last two years, I've spent a ton of time paring down our belongings, and revisiting our layout and decor again and again to really figure out if our home matched our values and lifestyle. I read the book The Life-Giving Home and HIGHLY recommend it. It was so helpful for me during this process! When people visit, they most often used words like refreshing, natural, relaxing, airy, bright to describe our home, which makes me so proud because that was exactly my goal. I want any home we own to be a haven for all who enter, to be a place of rest and respite. I also want our home to match our values - namely, that people understand what we hold dear the minute they walk in the door. Our Catholic faith, travel, family, experiences, nature, play, adventure, to name a few. I am so excited to have a blank canvas to work with in just a few months, but will always treasure the memories made in this little home over the last 3.5 years! Without further ado - welcome to our home! When you walk in the front door, you're basically right in our living room. You can see the front door in that first photo. 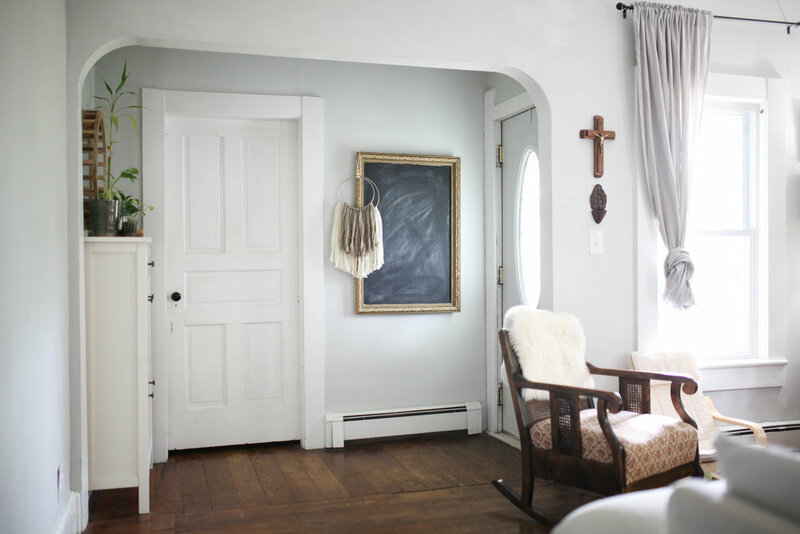 I love the original archway, and really wanted to turn that tiny little entry into the gateway to our home! The kids room is also off the living room. They share, and it's the best ever! Down the hallway is the bathroom and our dining room! From the dining room, you walk into the kitchen. There's another original archway, which I love! 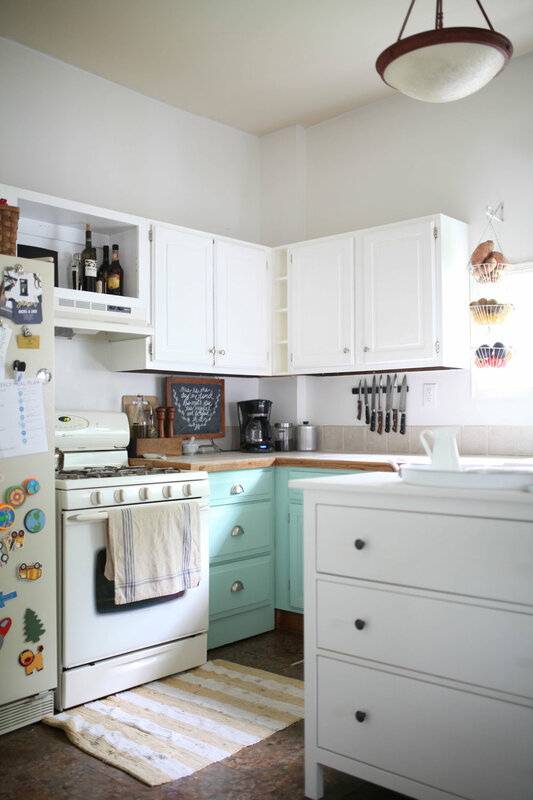 We've done the most work to our kitchen - painting the walls and cabinets, along with lots of styling. From the kitchen, you get to my office. This is also where the back door is, which is the door we're constantly using to come and go since it leads out to the garage. 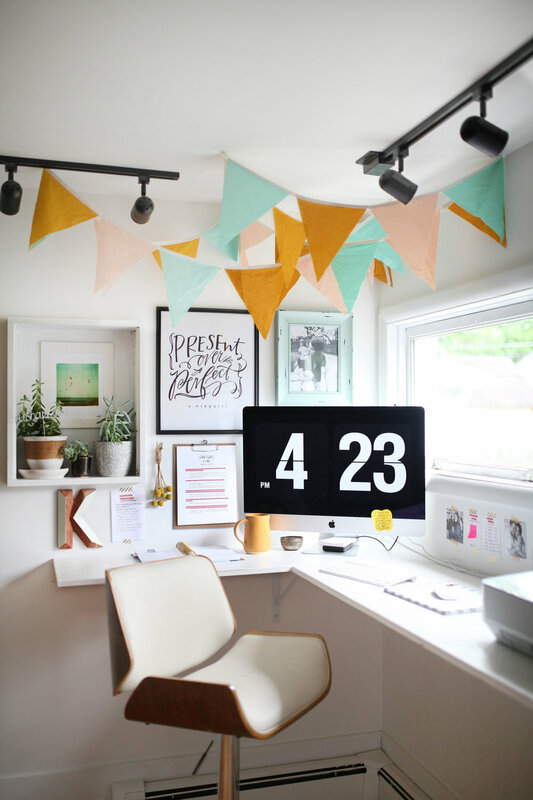 You can view more photos and words about my office on the feature School of Styling did a couple years back! Off my office is the laundry room. 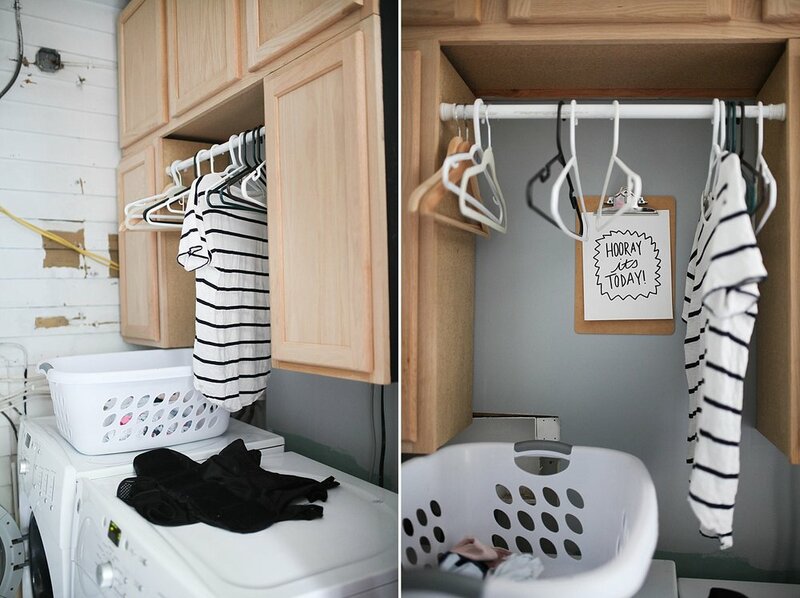 We've packed a TON of storage into this tiny space! And there you have it! Our sweet, 1,200 square foot, 2-bedroom, 1-bathroom home. I'll be sharing the floor plan for the renovation soon and the style we're going towards for the updates! XO! 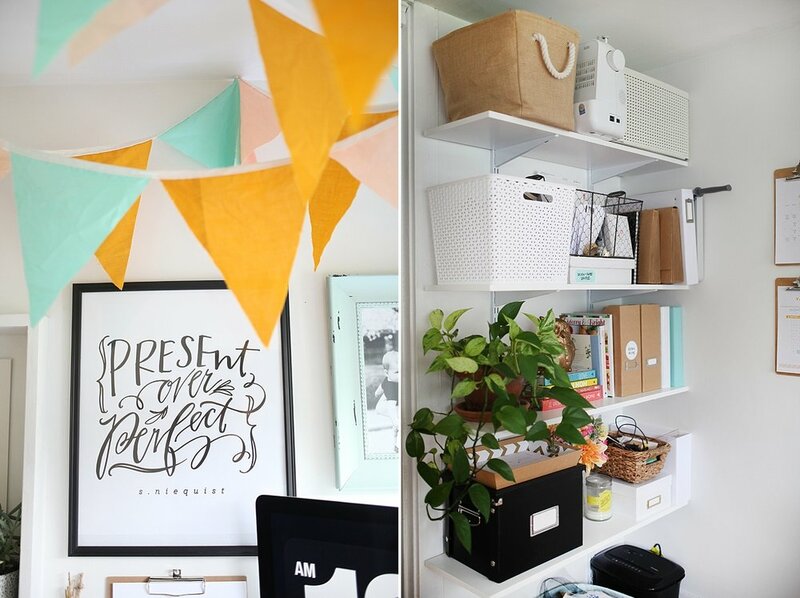 I'm deep into spring cleaning mode, thanks to the #RuthlessDeclutterChallenge by Emily Ley. As I've been working on streamlining our home, I've been moving things around and redecorating little corners (naturally). 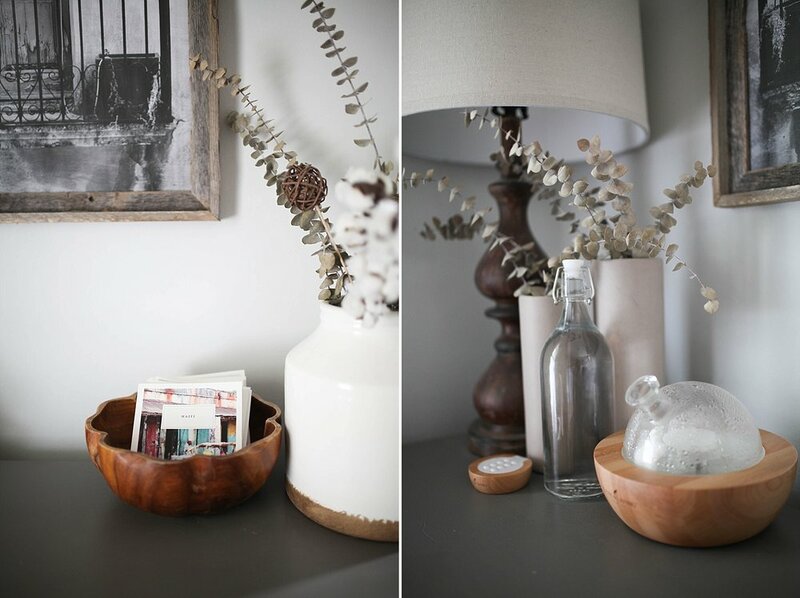 I realized that quite a bit of the art and decor in our home was either a DIY or super affordable, and wanted to share my favorite sources, tips and tricks! 1. Wall hangings. 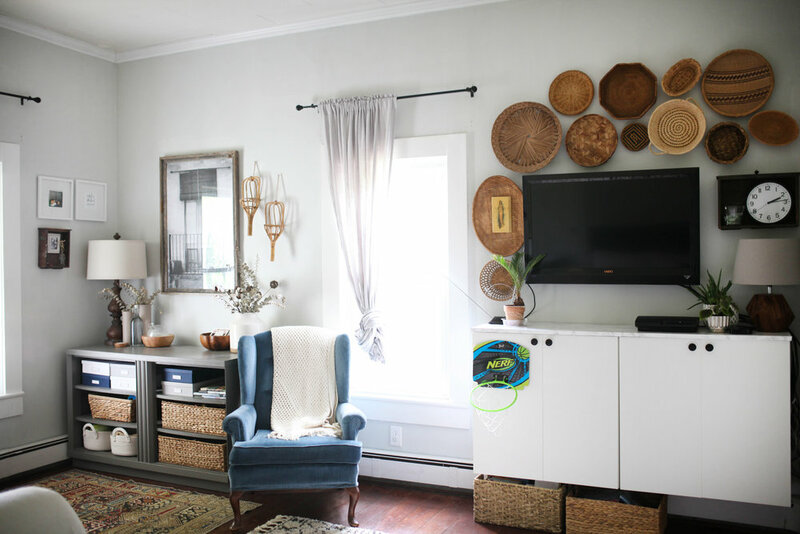 Woven wall hangings are all the rage right now, but even without any weaving or macrame knowledge, you can make a super cool piece for your home. Just grab a dowel rod or, my favorite, a piece of driftwood or cool stick, and loop some cool chunky yarn on it! 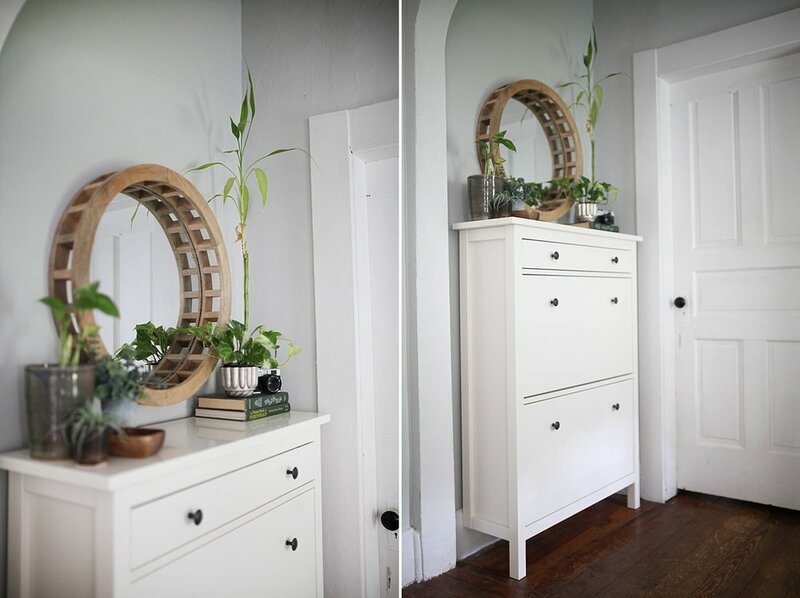 SO easy and it makes for a really cool statement piece in your home! 2. Maps. I often find large vintage maps at antique stores for a couple bucks, which can be framed or simply tacked up! I turned a couple unused tomato stakes into a schoolhouse-style frame for a vintage map I had, and love the way it turned out. Or, you can google for maps! Set the image setting to the largest size, and type in any type of map you want. I found a really cool trail map for Xavier's room that I printed on my regular home printer on cardstock. I love the way it looks above his bed! 3. Large-scale photographs. There is a magical thing that I'm not sure everyone knows about, and it's called engineer prints. Intended for large items like blueprints, these oversize prints also work for blown-up photos! I print mine at my local Staples. Warning: the website will say "not suitable for photographic prints." Just ignore that. They're going to look sort of grainy because the paper is so thin and they just aren't intended to be high-quality, but that's half the charm. I printed a huge photo I took in Spain for our living room, and it cost $5. Amazing! 4. Text over photos. Thanks to super easy programs like Canva, even the non-designer can make printable art in a flash. Upload a photo or choose from one of their stock photos, overlay text and voila! You're done. Some of my favorite art I've created for our home is a simple word or phrase overlaid on a photo and framed. 5. Vintage art prints + photographs. Did you know that the internet is full of awesome old photographs and art prints that are FREE? So cool! Free Vintage Art has some cool ones, as does New Old Stock. Also, you can google old artists (like from the 16th, 17th and 18th centuries), find a decent-sized image on google images, and print that! I love these pieces by Simon Pietersz Verelst - so lovely. Other phrases to google: 16th century dutch painting floral, 18th century floral painting, 19th century landscape photography. The possibilities are endless! 6. Framed mementos. A postcard. A handwritten recipe from your mom. The receipt from a fancy dinner you went to on your honeymoon. A four-leaf clover you found in the backyard. All of these things are things that can, and have in our case, been framed and displayed as art. Frames are not just for photos. Get creative! 7. Baskets. I love to use baskets in decorating. 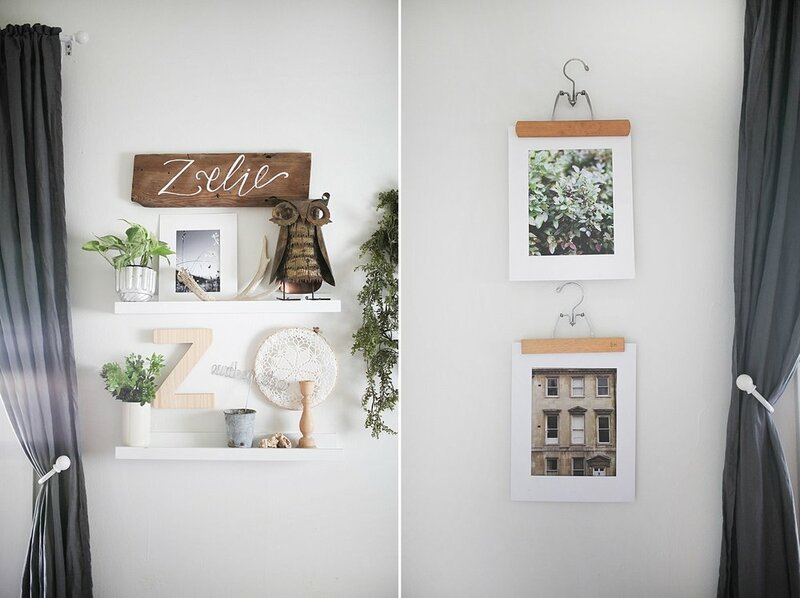 You can usually find them for super cheap at thrift stores, and they make an awesome statement wall, gallery wall, or frame for a picture frame. They're a great way to add interest and texture on the cheap! 8. Natural elements. I have a bird nest sitting under a cloche, and regularly use other natural elements that I bring in from outside to decorate. My friend Maria spray painted this giant stick white, and it sits on top of her entertainment center and is a gorgeous art piece in her living room. Jump on Pinterest and there are a million ideas for how to forage for art in your backyard. Any other tricks for cheap art for your home? I'm all ears! XOXO! There are a lot of things I wish for when it comes to my kitchen, but an actual pantry is high on the list. 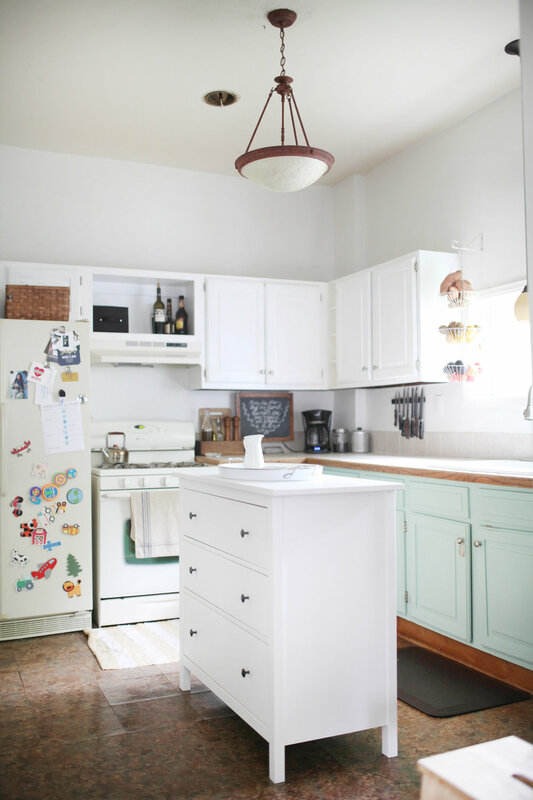 We've successfully turned two of our regular kitchen cabinets into a makeshift pantry and it's working, but you can bet I still drool over photos by The Home Edit of gorgeous, meticulously organized walk-in pantries. Someday! In the meantime, though, this cabinet pantry situation really is working well for us. 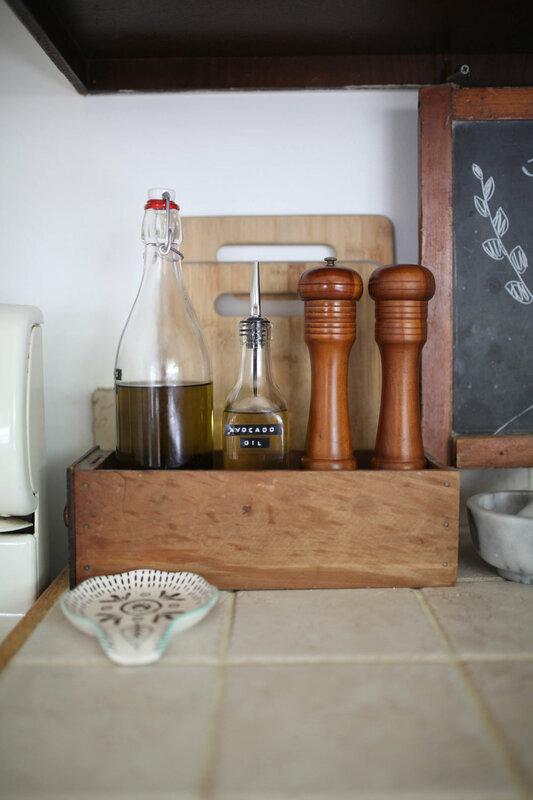 I wanted to share it today in case you, too, are trying to figure out how to make a smaller kitchen or nonexistent pantry work for you! We set aside two of our cabinets for our pantry - which was a pretty hefty chunk of our cabinetry. As a caveat before I get started - a huge reason this works is because we wayyyyyy downsized our kitchen. All of our eating dishes, glasses, our baking dishes, so on and so forth all fit in ONE cabinet. Downsizing our dishes freed up a lot of cabinet space to turn into food storage. Minimalism all the way, you guys. Another trick to making this work for us is to take everything out of packaging that I can. I empty pretty much everything into a labeled glass canister or bin. I like being able to find exactly what I'm looking for quickly, being able to see exactly how much is left of something, and not having to dig through a zillion boxes to get what I need. Because of our limited space, we can't buy in bulk, but that's okay. We buy what we use, use what we have, and replenish when it's gone. It's a good system for our family! I love to get glass canisters at Hobby Lobby, when their glassware is 50% off. They have a huge selection! I've found bins all kinds of places - just be sure to measure your cabinet before shopping. 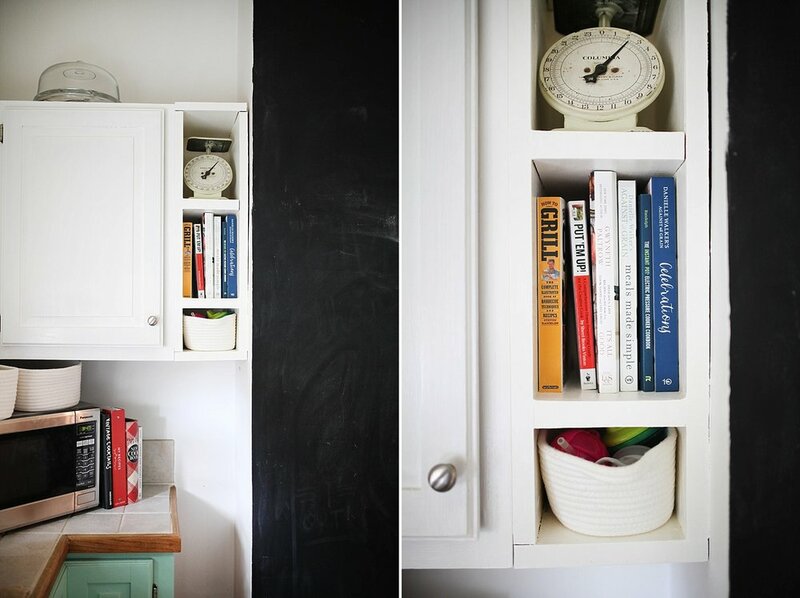 Save a note in your phone with the depth of your cabinets, the height for each shelf and the width where you want to put a bin or jar, that way you save yourself the headache of buying something that's a hair too big! I also utilize turntables, or lazy Susans. They work great for cans, bottles and such and make finding what I need a snap! For bags of chips and other bigger things, I have two baskets on top of the fridge and we just toss everything up there. I try to keep one basket for bigger bags like chips and one basket for smaller things like crackers and rice cakes, but they all end up mixed up, and I don't really care all that much. And there you have it! Simple, practical food storage when a pantry is nonexistent. 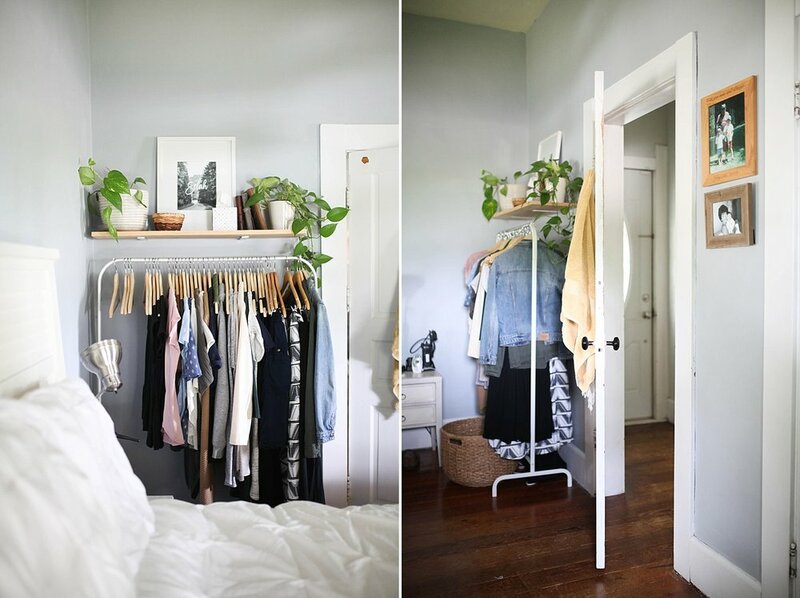 Do you have any other tips + tricks for living in small spaces? I'd love to hear! Happy Tuesday! 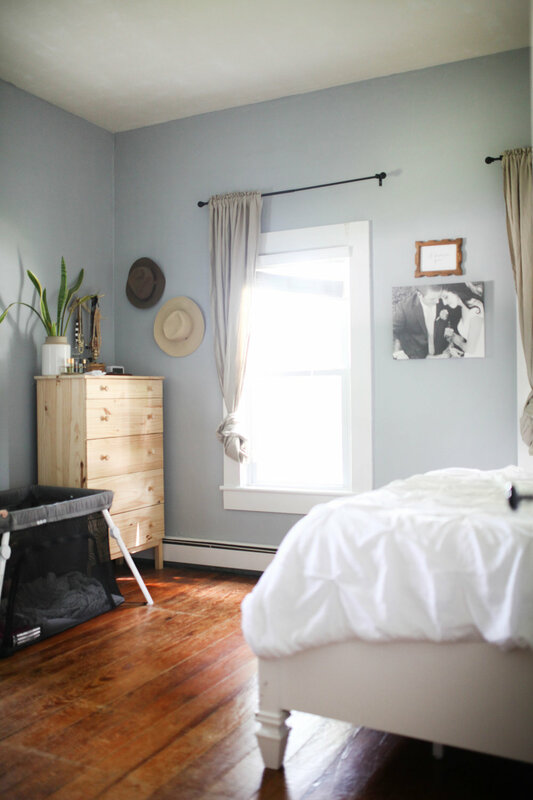 Now that Zelie and Xavier are officially sharing a room (more on that later), I figured I'd go ahead and blog the little corner we created for her in our master bedroom (LOL). Our house is only two bedrooms, so we knew Z would be bunking in with us for awhile until we could move the kids in together. We opted to just go ahead and put her crib in our room from the get-go and not mess with a bassinet and such. Our room is pretty good size and there was plenty of space for her crib and a small dresser that held all of her clothes, swaddles, blankets, etc., with a changing pad on top. I know this isn't the case for everyone, but it worked out really well for us. 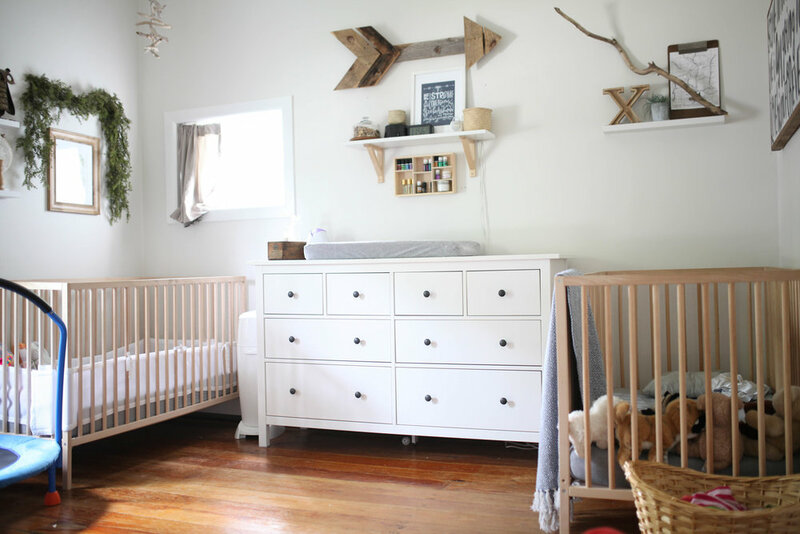 It was really fun to put together this sweet little corner in the weeks leading up to Zelie's birth, and I love that she had a little space all her own for her first few months of life!